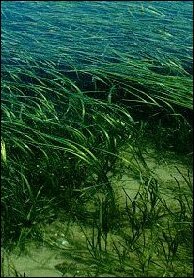 Seagrasses are flowering plants. Forty-nine species in 12 genera are known. Most are dioecious—i.e., there are separate make and female plants. The flowers are simple and open underwater; pollen is transported by waves and currents. However, they also reproduce vegetatively via rhizomes and form dense mats or meadows often composed of a single species. Totally immersed in seawater, the long, linear leaves have no stomata. The plants never exchange gases with the atmosphere. They absorb carbon dioxide that is dissolved in the water and utilize the oxygen they themselves produce during photosynthesis. 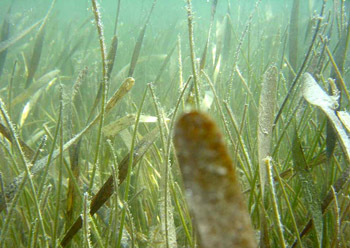 Eelgrasses (Zostera spp.) and wigeongrasses (Ruppia spp.) dominate temperate seagrass meadows. Turtlegrasses (Thalassia spp.) and tapeweeds are important in the tropics. Sea grasses grow on fine sediments in the subtidal zone at depths where sunlight is adequate for photosynthesis. Actual depth depends on water clarity. Along the east coast of the US, the favorable zone may only extend 3 ft deep, but elsewhere—in clearer waters—it can be more than 100 ft deep. The meadows are highly productive, but few animals feed directly on the grasses. Those that do tend to be vertebrates such as sea turtles, dabbling ducks, geese, and manatees and dugongs. The leaves of sea grasses are often covered with epiphytic algae, bacteria and small invertebrates such as protozoa, nematodes, and hydrozoans. Amphipods and isopods graze the algae; snails and fish eat both the algae and the invertebrates. Much of the primary production of the seagrass meadow enters detritus food webs. Detritovores include members of the infauna such as polychaetes and members of the epifauna such as crabs, shrimps, and fish. Other crabs and fish hunt and scavenge through the canopy of grasses. Sea horses hide among the leaves, waiting in ambush; stingrays lurk in the sediments. Fish predators are mainly after detritus-feeding crustaceans. The meadows provide food and shelter and therefore are important nursery areas for shellfish and finfish, as well as refuges for adults. They serve as essential wintering grounds for such Northern Hemisphere migratory waterfowl as Brant and American Wigeon. 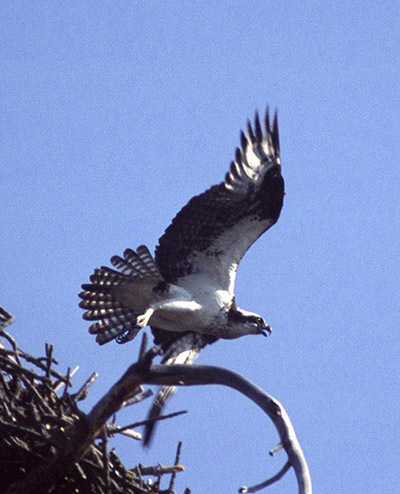 The abundance of fish attracts Ospreys and fish-eating eagles.